Simple, Durable. Versatile. Inexpensive. Created to meet the demands of the environment. the tree tie represents unparalleled design and ease and versatility. Fabricated from flexible vinyl, The tree tie is formed into a single, self-locking component. 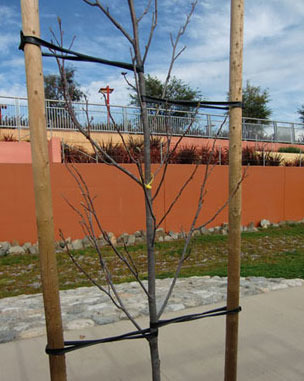 The result is an adaptable and resilient tree that allows quick installation and removal. In addition, it can be reused, which makes it extremely economical. HOZEWIRE The combination of vinyl tubing and galvanized wire create a simplistic yet effective design for Hozewire tree ties. Hozewire are available in both 27" and 36" lengths.